Would YOU like to become a contributor? Email us at [email protected] and we’ll get back to you. Andy Jones, editor, is a graduate student, freelance writer and communications consultant, and a volunteer DJ at KNCE 93.5 FM. He is a father, musician and fan. He's also an an extroverted introvert with fair-to-middling conversation skills. Say hi when you see him at the grocery store. Barnaby Hazen is a teacher, musician, or misanthropic writer by trade, depending on when you ask him. He's currently finishing a book of short stories. He plays bass for the Liz Painter band and guitar for the band Out of Nowhere. He's also been known to play bass with a strange songwriter who lives down the street from him by the name of Jasey Davis. He can sometimes be found vaguely dancing to Katy P with his wife, and there's just no telling what he'll do next. David is a writer, filmmaker and former political operative. He is from the Washington, DC area and graduated from the College of Santa Fe in Moving Image Arts. He has worked with groups like American Dust and Meow Wolf, and is currently producing "Successful Outlaw," a documentary about a local radical. 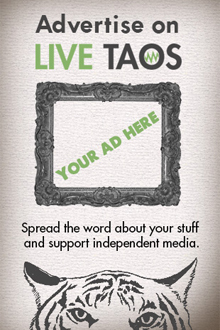 I am a programmer and thinker living in Taos. Troubadour, Musician, and New Mexico born Renaissance Man, Devin has been legendary in many different ways, known coast to coast as The Southwest Kid. Honing in his skills growin' up a lot in Austin, TX, passing through his home in NM while living in Northern California for his most recent years. Touring, writing, playing, changing, and experiencing this life that he is so lucky to enjoy, hate, and all in between. No article or bio will ever be able to cover a speck of his life entirely -- being back in Taos, he is working hard to be part of a community again. He does not work on Taos Time so excuse him for his Jack Hammerish motivation. He is your Utility Knife -- Use Him!!! As an Anusara Inspired E-RYT 200 yoga teacher, Genevieve Oswald loves to live her yoga. When not rolling around on the floor Genevieve can be found practicing yoga in a myriad of ways: seeking equilibrium in marriage to the man of her dreams, dancing in cooperation as a co-owner of Shree Yoga Taos and Sundara Studios Inc., co-creating with the mysterious source-energy of the divine in her weekly blog www.unconditioningtheheart/wordpress.com, balancing work with pleasure while regularly enjoying coffee at her favorite local café, expanding her capacity to communicate effectively when walking her spirited dog, and anywhere else she winds up in this wild ride called life. Genevieve teaches yoga classes that inspire openhearted willingness, mindful presence, and the integration of the physical, mental, and emotional bodies to enhance self-awareness and improve the overall quality of one's life, from the heart into the world. Hannah moved here from Portland Oregon where she received a BFA in English Literature from Lewis & Clark College. She's trying to become a renaissance woman, but she'd like to be thought of as a normal girl with bizarre interests. Mostly she just gets wired on coffee and looks out the window! Irene Loy is a writer, performer, and non-profit professional living in Taos. She is from Indiana and holds an MFA in Dramatic Writing from the University of New Mexico in Albuquerque. She enjoys travel, making connections, and really good key lime pie. Jennifer Ammann writes whenever she can. She teaches Yoga, loves to dance, and lives with her three boys becoming men who also happen to be budding writers, actors, musicians, and dancers. South African ex-pat in Taos, Lynne is a published poet and writer. She's been a long time contributor to the now-defunct Horse Fly, the Taos News and Taos Magazine. She wrote 6 profile pieces for Paul O'Connor's award-winning book Taos Portraits. Her 1978 interview with Bob Dylan (under her former nom de plume, Lynne Allen) is included in Younger Than That Now: The Collected Interviews With Bob Dylan. Avalon Books. Find more of her work at taoStyle.net, a blog about who and what's happening up here in Taos. Maxwell Tart studied pastry & guitar at the Tart Institute of Technology. Mel has always had trouble focusing (look, a puppy!) but maybe that's not such a bad thing when it means exploring a diverse range of interests like writing, photography, metalsmithing, dancing, acting, and even a little puppetry. She is a sucker for all things furry, most things scaly, and some things slimy. Prolific writer, poet, blogger, journalist, videographer, and photographer. Quite the social butterfly, and enjoy engaging in youth advocacy. Michael Miro is a Taos artist working in the medium of glass. He has been a graphic artist, writer, videographer and social organizer. In the 1980s he published a music magazine in the San Francisco Bay Area called BravEar which focused on the alternative music scene that was emerging at the time. He moved to Taos in 2003 to pursue his art. Music has always been his passion and searching the world for whatever is new and exciting remains his obsession. I own a wimpy Subaru with a big sub-woofer, bake bread, have a cat, bang on drums, record music, drink wine, own a business, run a radio station, and grow tomatoes. Nikki Lyn Pugh writes for edible magazine, Taos News/Tempo and various other publications around the area. She also schleps herself out to good causes (and good people) every chance she gets as a marketing copywriter and book editor. More information can be found at www.asyourword.com. Rita has been writing, performing, reading, eating, crafting, and playing in Taos since 2007. She's a co-founder of LiveTaos, and a co-owner of KNCE93.5FM, True Taos Radio. She is pleased that you found your way here. More about her at www.RitaOConnell.com. It took nearly three decades of bouncing in and out of Taos for Ross Burns to ditch his waspy, Midwestern shadow. He writes because he cannot sing. More of his work can be found at rossburns.org. Sarah is owner/operator of Hart Print Shop, a local screen printing and design company. She loves a good time, loud music and fine art! Steph likes to read Ray Bradbury books, spin fire, serve drinks, curse, giggle, and watch stand-up comedy. She generally means no harm. Find her on Christianmingle.com!